On 30 November 1991, the United States women's national team beat Norway 2-1 in the inaugural FIFA Women's World Cup Final before a crowd of 63,000 at Tianhe Stadium in Guangzhou, China. The United States entered the Final after winning all of their previous matches in the tournament, including a 5-0 hammering of Brazil in the group stage, a 7-0 demolition of Chinese Taipei in the quarterfinals, and a 5-2 victory over Germany in the semifinals. Norway, meanwhile, had opened the tournament with a 4-0 defeat to hosts China, but then put together a string of wins to reach the Final, including a convincing 4-1 victory over Sweden in the semifinals. US midfielder/forward Michelle Akers (pictured) entered the Final as the Cup's leading scorer with 8 (5 of which came in the win over Chinese Taipei). True to form, she gave the Americans the lead with a goal in the 20th minute, but Norway struck back with a 29th-minute equalizer from forward Linda Medalen. The match remained even until the 78th minute, when Akers pounced on a stray back pass from Norway's Tina Svensson and sidestepped keeper Reidun Seth to tap the ball into the open net. The goal gave the United States the win and upped Akers' tally to 10, making her the tournament's top scorer. Norway got their revenge in 1995, when they eliminated the United States in the quarterfinals, 1-0, then beat Germany in the Final. 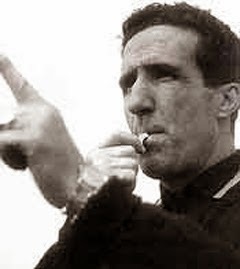 On 29 November 1904, former Uruguayan international forward and manager Héctor Castro was born in Montevideo. 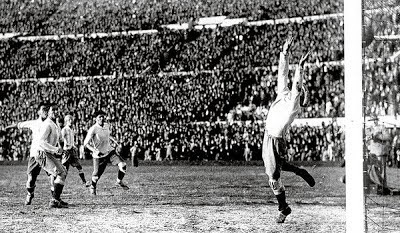 He also earned honors in the 1930 World Cup, memorably scoring the last goal in Uruguay's 4-2 win over Argentina in the Final (pictured above). He left Nacional in 1932 for Argentinian club Estudiantes, but returned to Nacional 1933 and won another national title before retiring as a player in 1936. In 1939, Castro returned to Nacional as manager, winning four consecutive Uruguayan championships (1940-43) before retiring in 1943. He returned for another season in 1952 and led the club to yet another Uruguayan title. Castro passed away in Montevideo on 15 September 1960 at the age of 55. 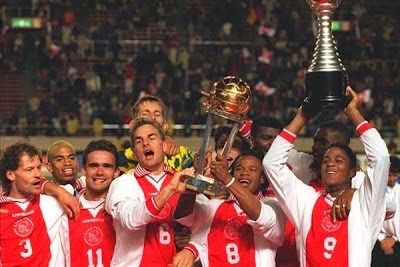 On 28 November 1995, Ajax claimed their second Intercontinental Cup by defeating Grêmio on penalties, 0-0 (4-3), before a crowd of 47,000 at Tokyo's National Stadium. Established in 1960, the Intercontinental Cup matched the reigning European champion against the reigning South American champion. The Cup was initially contested as a two-leg home and away tie, but switched to a single-match format in 1980. Both Ajax and Grêmio had previously participated in the Cup, with successful results. Ajax's prior appearance was in 1972 and ended as a 4-1 aggregate win over Argentinian side Independiente. Grêmio's earlier match was a 2-1 extra-time win over Hamburg in 1983. In the 1995 Final, the two teams were even at 0-0 at the end of extra time, despite the Brazilian side losing defender Catalino Rivarola to a red card in the 57th minute. In penalties, the shooters got off to a rough start with Ajax keeper Edwin Van der Sar saving the first shot from midfielder Dinho, while the next two shots, from Ajax forward Patrick Kluivert and Grêmio defender Francisco Arce, were off target. The remaining kicks were converted, however, with Ajax center back Danny Blind scoring the decisive shot. Blind was subsequently chosen as man of the match. Starting in 2005, the Cup was taken over by FIFA and renamed the FIFA Club World Cup. On 27 November 1994, Raith Rovers defeated Celtic on penalties before a crowd of 45,000 at Glasgow's Ibrox Stadium to claim the club's first (and, to date, only) Scottish League Cup. Founded in 1883, Rovers had enjoyed some past success, winning the First Division in 1907-08, 1937-38, and 1948-49 (a season in which they also made it to their first Scottish League Cup Final, but lost to Rangers). They began to decline through the 1950s and '60s, including relegation to the second and third divisions, but had started a resurgence in the early 1990s, earning promotion to the Premier Division for the 1993-94 season (though they were relegated back to the First Division for the following season). At the same time, Celtic were in the midst of an uncharacteristic fallow period, having gone five seasons without winning any major silverware. They were close to ending that streak against Rovers, after going up 2-1 in the 84th minute, but Rovers striker Gordon Dalziel equalized two minutes later. The teams battled through extra time but could not break the deadlock, sending the match to penalties. Each side's first five shooters converted and it went into sudden death. 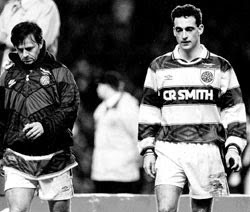 Rovers went first and again found the net, so the tally stood at 6-5 Rovers when Celtic captain Paul McStay (pictured) stepped up for his kick. He sent it low to the left, where Rovers keeper Scott Thomson met it and turned it away, giving Rovers the victory. Rovers returned to the Premier Division in 1995, but were relegated again in 1997. They currently play in the First Division. Celtic finally ended their silverware drought in 1995 by winning the Scottish Cup. On 26 November 2003, Milan defeated Ajax 1-0 in a Champions League group stage match before a crowd of 50,000 at Ajax's Amsterdam ArenA. The match was the 100th European Cup/Champions League appearance for Milan defender Paolo Maldini and the fourth time the two teams had met in the Champions League in 2003. Maldini signed with Milan as a youth player in 1978, then as a professional in 1984. He made his first European Cup appearance in the 1988-89 campaign, which saw Milan claim its third title in the competition. By November 2003, Milan and Maldini had claimed three more European Cup/Champions League trophies (1990, 1994, 2003). Ajax and Milan had a long history together in the competition, dating back to the 1969 Final in which Milan beat the Dutch club 4-1. Ajax returned the favor in the 1995 Final with a 1-0 win over the Italians. The clubs met in the quarterfinals of the 2002-03 Champions League, with Milan emerging victorious by the aggregate score of 3-2. Maldini's century match was the second leg of the 2003-04 group stage, with Milan having won the previous leg 1-0 at home. In Amsterdam, Ajax battled to 0-0 draw at the break, despite having had to withdraw their star forward Zlatan Ibrahimović in the 40th minute due to injury. In the 51st minute, Milan striker Andriy Shevchenko chested a Cafu pass in front of the goal and calmly put the ball into the net. Milan then held on for the 1-0 win. Both Ajax and Milan lost their last group stage matches, Ajax to Brugge and Milan to Celta Vigo. Ajax's loss to Brugge dropped the Dutch club to the bottom of the table and out of the competition. Milan finished at the top of the table to advance to the knockout rounds where they successfully defended their title. 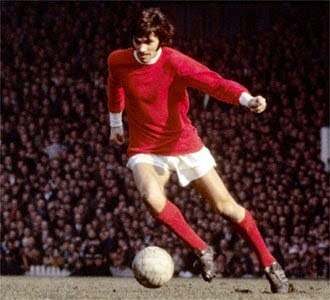 On 25 November 2005, former Northern Ireland international and Manchester United superstar George Best died in London. His death was caused by complications related to a liver transplant required after years of alcohol abuse. Best was born and raised in Belfast where, at the age of 15, he was discovered by a Manchester United scout. He joined United's youth academy, then signed a professional contract with them in 1963. He soon became a crowd favorite, with his flashy playing style and long-haired good looks earning him the nickname "the Fifth Beatle" and making him one of football's first international superstars. He helped United to several honors, including the European Cup in 1968, the same year he was named European Footballer of the Year. Unfortunately, Best's playing career began to suffer as he battled with his alcoholism. He left United in 1974 and started a journey that saw him play for a number of different clubs, including the Los Angeles Aztecs (1976, 1977-78), Fulham (1976-77), Ft. Lauderdale Strikers (1978-79), Hibernian (1979-80), and the San Jose Earthquakes (1980-81). He last played for Tobermore United in the Northern Irish league, for whom he made a single appearance in 1984. He also earned 37 caps for Northern Ireland between 1964 and 1977, but the side did not qualify for the World Cup during that time. 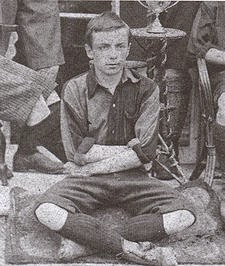 On 24 November 1874, Charles William Miller, the man who introduced football to Brazil, was born in São Paulo, Brazil to a Scottish father and a Brazilian mother. In 1884, like many children in Brazil's British community, Miller was sent by his parents to England for his education. He enrolled in a public school on the outskirts of Southampton, England, where he was introduced to football. While overseas, he played for Corinthian FC in London and St. Mary's, the forerunner of Southampton FC. He returned to Brazil in 1894 with a football and a set of rules and set about organizing matches among the British expatriates. He was one of the founding members of São Paulo AC and also helped organize Brazil's first football league. With Miller at striker, São Paulo won the first three league championships (1902, 1903, 1904). A few short years after Miller's return from England, football had become Brazil's most popular sport. 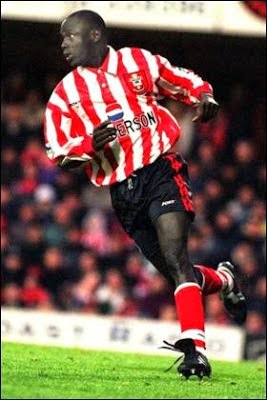 On 23 November 1996, Senegalese striker Ali Dia made his Premier League debut, coming on as a first-half substitute for Southampton in a 2-0 away loss to Leeds. Dia had just recently been signed by Saints manager Graeme Souness, who had learned of the striker during a phone conversation with someone claiming to be Liberian legend George Weah, the 1995 FIFA World Player of the Year. The caller recommended Dia to Souness, saying that he had played for Weah's former club Paris St. Germain, as well as making 13 international appearances. On the strength of that recommendation, Souness signed Dia to a one-month contract, sight unseen. Although Dia was unimpressive during training, Souness included him on the bench for the match against Leeds and subbed him on in the 33rd minute for midfielder Matt LeTissier. It became readily apparent, however, that Dia was not the talent Souness had been led to believe and the manager pulled him after 20 minutes. Leeds went on to win the match with two late goals from Gary Kelly (82') and Lee Sharpe (89'). Shortly afterward, it was revealed that the call to Souness had not been from George Weah, but was actually from Dia's agent and that none of the purported facts stated during the call were accurate. Although Dia himself denied any knowledge regarding the call, the Saints released him from his contract after two weeks. Souness resigned at the end of the 1996-97 season, citing differences with club chairman Rupert Lowe. Labels: Ali Dia, Gary Kelly, George Weah, Graeme Souness, Lee Sharpe, Leeds United AFC, Matt LeTissier, Southampton F.C. 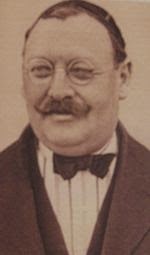 On 22 November 1877, Barcelona founder, player and president Hans-Max Gamper was born in Winterthur, Switzerland. An avid sportsman, Gamper grew up in Zürich, where he helped found and played for both FC Excelsior and FC Zürich. He also played for FC Basel. In 1899, he moved to Barcelona and, on 22 October, placed an ad inLos Deportes calling for people interested in forming a club. Several people responded and, on 29 November, they founded FC Barcelona. Gamper reportedly chose the club colors of red and blue, based on Basel's colors. He made 48 appearances for Barça between 1899 and 1903 and helped them claim their first silverware, the 1902 Copa Macaya. By 1908, the club's fortunes had begun to fade. With membership declining, it appeared that Barça was on the verge of shutting down. Gamper volunteered to serve as president. He rejuvenated the membership and guided the club to an undefeated season and the 1909-09 Catalan Championship. He stepped down as president after that season, but later served four more terms when called upon (1910-13, 1917-19, 1921-23, and 1924-25). His last term ended on 17 December 1925 when the Spanish government, in a crackdown on Catalan independence, deposed the entire board and closed the club's doors for six months. Gamper, who by then went by "Joan," the Catalan version of his name, returned to Switzerland. He subsequently became depressed over personal and financial problems and committed suicide on 30 July 1930. In 1966, Barça established the Joan Gamper Trophy, an annual preseason friendly, in his honor. On 21 November 2007, the final day of qualification for Euro 2008, Croatia defeated England, 2-3, before a rain-soaked crowd of 88,000 in London's Wembley Stadium. The loss eliminated England from the tournament and sealed the fate of England manager Steve McClaren. England started the day in second place in Group E on 23 points. They were three points behind leaders Croatia, who had already booked their place in the tournament, and two points ahead of third-place Russia, who were facing last-place Andorra. England had lost to Croatia 2-0 in Zagreb, but were hoping for a better result at home, despite missing several key players, including forward Wayne Rooney and all four players from their preferred back line. The available personnel forced McLaren to change the formation from a 4-4-2 to a 4-1-4-1, with Peter Crouch playing as the lone striker. England's hopes took a blow in the 8th minute, as Croatian midfielder Niko Kranjčar found the back of the net with a 25-yard shot that was helped past keeper Scott Carson by a tricky bounce off the wet pitch. 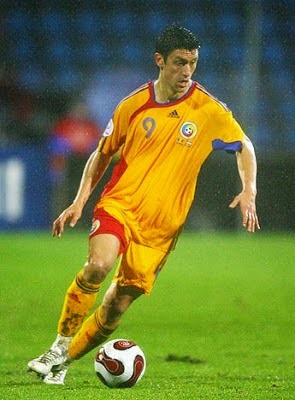 Ivica Olić doubled the visitors' lead in the 14th minute as a precision pass by forward Eduardo da Silva beat the English defense and allowed Olić to walk the ball into an open goal. England entered the second half to a chorus of boos and jeers from the home fans, but soon gave them something to cheer when Jermain Defoe won a penalty which Frank Lampard converted in the 56th minute. Peter Crouch equalized nine minutes later with a goal from a David Beckham pass. As it turned out, a draw would have been enough to see England through on goal differential, but it did not last. Croatian substitute forward Mladen Petrić (pictured), who had replaced Eduardo in the 69th minute, beat Carson with a 25-yard stunner in the 77th minute. England were unable to find another equalizer and conceded all three points to Croatia. Russia, as expected, beat Andorra and moved into second place in the group, dropping England into third and out of the tournament. The FA terminated McClaren's contract the next day after only 18 matches in 16 months, making his time in charge of the national team the shortest of any England manager. On 20 November 1971, Third Division side Bournemouth thoroughly thrashed the Southern League's Margate by the score of 11-0 in the First Round of the 1971-72 FA Cup. Bournemouth's hero that day was 24-year old Scottish forward Ted "SuperMac" MacDougall (pictured), who scored nine of the Cherries' eleven goals. 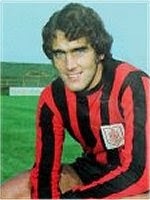 MacDougall had joined Bournemouth in the summer of 1969 (when the club was still known as "Bournemouth & Boscombe Athletic") after being acquired from York City for £10,000. He scored 21 league goals for the Cherries that season, but they were nonetheless relegated to Division Four. Under new manager John Bond, they were promoted at the first opportunity and were enjoying their return to the Third Division when they met Margate in the FA Cup. MacDougall scored five goals in the first half, prompting the Margate manager to ask Bond jokingly to substitute the forward in the second half. MacDougall went on to score four more after the break. The Cherries advanced to the Third Round where they were eliminated 1-0 by Walsall. MacDougall moved to Manchester United in September 1972 for a transfer fee of £200,000, but never settled. He played for a number of other clubs, including a second stint at Bournemouth, before retiring in 1980. His 9 goals still hold the FA Cup record for the most scored by a player in a single game. On 19 November 1969, Santos defeated Vasco da Gama away, 1-2, before a crowd of over 65,000 at the Maracanã Stadium in Rio de Janeiro. The winning goal was scored by 29-year old Santos forward Pelé--his 1,000th goal for club and country. 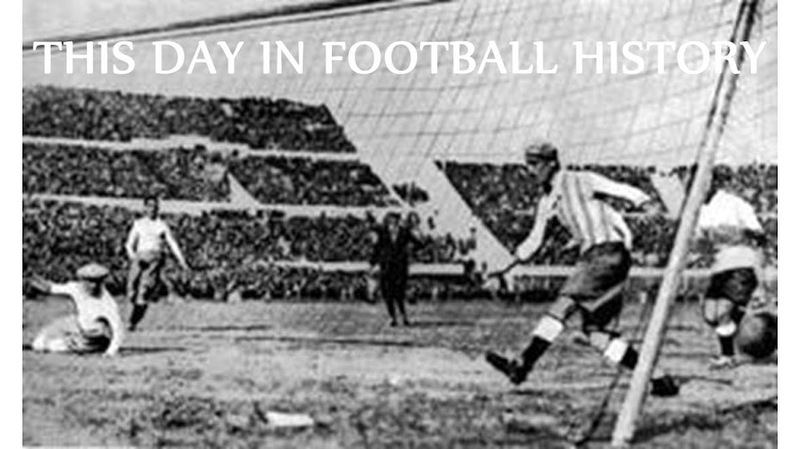 The Brazilian public was eager to see the goal, known as "o milésimo." In Santos' previous match, with Pelé sitting on 999 goals, the home crowd booed when one of their own players blocked one of Pelé's subsequent shots. The Vasco da Gama supporters were no different, cheering each of his attempts on 19 November. The Vasco da Gama players, however, were eager to prevent the milestone from occurring against them. 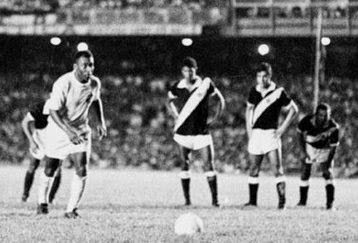 Indeed, when a Santos player sent in a cross for Pelé, a Vasco defender headed it into his own goal rather than allow Pelé to receive it. The moment finally arrived late in the match after Pelé was tripped in the box and the referee signaled for a penalty. Pelé calmly stepped up to the spot and slotted a low shot into the bottom right corner to claim the win. The crowd invaded the pitch and carried Pelé away on their shoulders. By the time he retired in 1977, Pelé had scored a record-setting 1,281 goals. While some critics claim that several of the goals should not count because they were scored in friendlies, FIFA nevertheless recognizes Pelé's 1,281 goals as the most ever scored by a professional footballer. On 18 November 2003, DC United signed United States U-17 international Freddy Adu to his first professional contract, making the 14-year, 169-day old Adu the youngest athlete to sign a professional contract for a team sport in the United States in over 100 years. Born in Ghana in 1989, Adu emigrated to the United States in 1997, becoming a US citizen in 2003. While growing up in Maryland, he quickly displayed a talent for the game. As a 10-year old, he played with the US U-14 squad and began to draw attention from noted clubs including Inter Milan and Manchester United. In January 2002, he joined the US Soccer Federation's U-17 residential program at the IMG Soccer Academy in Bradenton, Florida. Despite the interest from Europe, Adu and his family decided he should stay close to home with MLS and DC United. He made his first appearance for DC as a second-half substitute in their season opener on 3 April 2004. He played in all 30 regular season matches, finishing with five goals and three assists, and also helped DC to the 2004 MLS Cup. Though moderately successful, Adu's time in DC was marred by complaints over playing time and positioning and, in December 2006, he moved to Real Salt Lake. He has since changed clubs a number of times, including a stint at Benfica and loan spells with Monaco and Belenenses. Before signing Adu, DC United had previously signed the league's youngest players in Bobby Convey (2000) and Santino Quaranta (2001), both of whom were 16 at the time they signed. On 17 November 2007, Argentina defeated Bolivia, 3-0, in a World Cup qualifier before a crowd of 43,308 at Buenos Aires' Estadio Antonio V. Liberti. In that match, Argentina captain Javier Zanetti made his 116th appearance for his country, becoming Argentina's most-capped player. 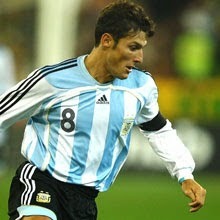 Zanetti made his international debut on 16 November 1994. He represented Argentina for the 1998 and 2002 World Cups, but was controversially omitted from the 2006 World Cup squad by then-coach José Pekerman. Pekerman resigned after the tournament, however, and was replaced by Alfio Basile, who recalled Zanetti for a friendly against France on 7 February 2007. Since then, he has remained a mainstay of the national team, with 136 caps at present. The match against Bolivia was a convincing win, with a first-half goal from Sergio Agüero (40') and a second-half brace from Juan Román Riquelme (56', 74'). Argentina struggled throughout the remainder of qualification, though, securing its trip to South Africa only on the last day with a 0-1 away win over Uruguay. 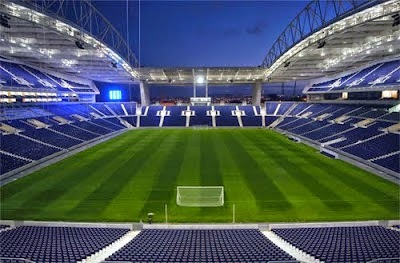 On 16 November 2003, Porto defeated Barcelona, 2-0, in a friendly held to inaugurate Porto's new stadium, Estádio do Dragão. Boasting a capacity of 50,399 and built at a cost of €98 million, the stadium was designed by architect Manuel Salgado as intended as one of the venues for the 2004 UEFA European Championship. The name Dragão, which is also a nickname for the club, refers to the dragon on Porto's crest. Barcelona were accommodating visitors for the opening match, conceding goals to Porto strikers Vanderlei Silva and Hugo Almeida. The match remains notable for the Catalan club, however, as the first-team debut for 16-year old winger Lionel Messi. Unfortunately for Porto, problems with the pitch prevented them from moving into the new stadium full-time until February 2004. Nevertheless, the new venue proved good luck for Porto, who went on that season to claim their 20th league title and their second Champions League trophy. On 15 November 2006, Romania defeated Spain, 0-1, in a friendly played in Cadiz. The match was Spain's last loss before going on a world record-setting run of 35 matches unbeaten, a streak that also saw them win the 2008 European Championship. Spain limped into the match against Romania, having been eliminated from the 2006 World Cup by France in the first knockout round and losing their last two matches, a couple of 2008 UEFA Euro qualifiers against Northern Ireland and Sweden. Manager Luis Aragonés shook up his side for the match, calling up Valencia star David Silva for his senior debut along with Celta Vigo's Angel Lopez and Sevilla's Javi Navarro. Silva threatened a couple of times during a scoreless first half, but Romanian striker Ciprian Marica notched the match's only goal when he beat Iker Casillas with a low second-half shot into the far corner. Spain rallied after the loss, rattling off a string of 35 unbeaten matches (32 wins, 3 draws) over the next three years. The highlight of that streak was the 1-0 win over Germany in the 2008 UEFA Euro Final. The United States finally ended the run, beating Spain 2-0 on 24 June 2009 in the semi-finals of the 2009 Confederations Cup. 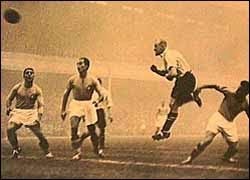 On 14 November 1934, England defeated Italy 3-2 before a crowd of 56,000 at Arsenal Stadium in London. Although a friendly, the match was a violent affair, resulting in several injuries, including broken bones, earning it the nickname "The Battle of Highbury." The match generated a lot of excitement, pitting World Cup-holders Italy against traditionally strong England. The Three Lions had not participated in the 1934 World Cup and viewed the match as an opportunity to stake their claim as the world's best side. Similarly, Italy sought to solidify their status as world champions. Prime Minister Benito Mussolini reportedly offered the Italian players a victory bounty including a car and the equivalent of £150 if they beat the English team. Monti's injury sparked retaliation by the Italians and English full back Eddie Hapgood received a broken nose, while outside left Eric Brook had his arm broken. Nevertheless, England took a 3-0 lead into the break with goals from Brook (3', 10') and Drake (12'). Despite being down a man, Italy fought back in the second half with a brace from inside forward Giuseppe Meazza (58', 62'). He came to close to completing a hat-trick, but his potential equalizer hit the woodwork and the match ended 3-2. In addition to providing a dramatic display of international football, the match set an English record by including seven starters from Arsenal--the first (and to date, only) time the English national team started seven players from the same club. On 13 November 1945, Dynamo Moscow drew with Chelsea, 3-3, at Stamford Bridge before a capacity crowd of 85,000. It was the opening match of Dynamo's British tour, which saw them also face Cardiff, Arsenal, and Glasgow Rangers. The tour was engineered by members of the FA and the Football League, who were looking to celebrate the resumption of English football after its World War II hiatus. As one of the Soviet Union's leading clubs, Dynamo generated a lot of interest in a British public that was still unfamiliar with the Soviet nation. The British press, however, was critical of the Soviets' footballing abilities, with one reporter saying Dynamo were "not nearly good enough to play our class of professional teams." The opening half against Chelsea appeared to prove him correct, as Dynamo went down 2-0. In the second half, however, Dynamo's fluid passing game allowed them to equalize. Late into the second half, new Blues signing Tommy Lawton appeared to win the match for Chelsea with a header, but Dynamo's Vsyevolod Bobrov scored a dramatic third for the Soviets, despite appearing to be offside. On 12 November 1881, Newton Heath FC defeated hosts West Gorton (St. Mark's) FC, 3-0, in a friendly. 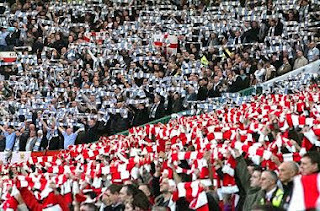 It was the first Manchester derby, as the Heathens later became known as Manchester United and the Saints later changed their name to Manchester City. The Ashton Reporter covered the match, calling it "a pleasant game." With that first match, played at the invitation of West Gorton, there have been a total of 168 contests between the two teams. United currently have the advantage with 69 wins to City's 49 (there have been 50 draws). The derby's top scorers is United's Wayne Rooney with 11, while City's Joe Hayes and Francis Lee are tied for second at 10 goals each. A number of players have taken the pitch for both City and United, including Denis Law, Peter Schmeichel, and, most recently, Carlos Tevez. 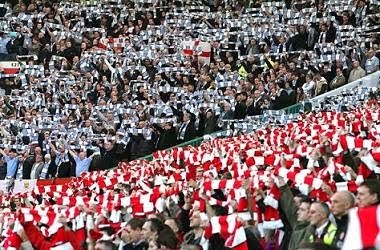 City are currently on a four-match derby win streak, with United's last derby victory coming on 9 December 2012. On 11 November 2008, Spanish third division side Real Unión Club de Irún lost away to Real Madrid, 3-4, in the Round of 32 of the Copa del Rey. Thanks to their 3-2 win in the first leg, however, Irún advanced on an aggregate 6-6 score with a 3-2 advantage in away goals. Irún had already been tested in the cup with early-round wins over CD Lugo (0-3), UE Sant Andreu (2-1), and Barakaldo CF (2-1). Real Madrid, on the other hand, was playing their first match of the tournament, entering the competition in the Fourth Round. The match was even at 2-2 in the second half, when Real Madrid substitute Alberto Bueno put his team ahead with a goal in the 69th minute. Real Madrid captain Raúl appeared to secure the Blancos' advancement with an 85th-minute strike--his third of the match--but a defensive miscue gave Irún another chance and midfielder Arangoa Eneko Romo scored the decisive goal in the 90th minute. It was the first time in Real Madrid's history that they were eliminated by a third division side at home. History soon repeated itself, however, as the Blancos were eliminated from the 2009-10 Copa del Rey in the Fourth Round by third division side AD Alcorcón. Irún's moment of glory was fleeting, as they were eliminated by Real Betis in the Fifth Round, 2-0. In 2009, they were knocked out in the Second Round by second division side RC Celta de Vigo, 2-1. On 10 November 2007, Crystal Palace drew at home, 1-1, in a league match against London rivals Queens Park Rangers before a crowd of over 17,000. The draw came courtesy of a late equalizer from Palace forward Clinton Morrison (pictured), whose 88th-minute strike was his 100th goal for the club. The England-born Irish international originally joined the Championship side's youth academy in 1996 and signed with the senior team in 1997. After an impressive five seasons, he moved to the Premier League with Birmingham City in 2002, but found it difficult to break into the first team and moved back to Palace in 2005. He got off to a good start in the 2007-08 season, scoring twice in his first three matches to bring his career Palace total to 99. He struggled to score thereafter, however, and was dropped from the starting line-up for several matches. Morrison returned to the starting eleven for the match against QPR and looked ready to hit the century mark. He sent a 25th-minute shot just over the bar, then had a 50th-minute shot ruled offside. In the meantime, QPR had gone up 0-1 with a 45th-minute goal from Scott Sinclair. The Palace forward's historic 100th goal finally arrived in the 88th minute, as he headed home the equalizer from a Palace free kick. Morrison celebrated the goal by running the length of the pitch. He was only the eighth player in the history of the club to reach the century mark. 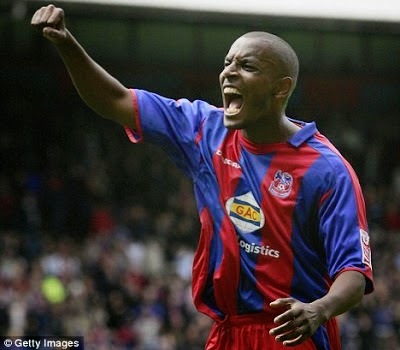 Morrison left Palace at the end of the season with a club, having scored a total of 113 goals. On 9 November 1997, 87-year old Helenio Herrera died in Venice from heart failure. Nicknamed "Il Mago," Herrera is remembered chiefly as one of the chief architects of catenaccio, the defensive strategy that helped Inter claim two European Cup trophies. Herrera was born in Argentina to Spanish parents, but moved to Morocco at the age of four where he became a French citizen. He started his playing career in Morocco, but moved to Paris in 1932 and played for a number of French teams. In 1944, he joined Puteaux for one season as a player-manager, then retired from playing in 1945. After undistinguished stints at Stade Français (1945-48) and Real Valladolid (1948-49), Herrera took over at Atlético Madrid where he was an instant success, winning the league in his first two seasons. After his third season, however, he left and started a journey that took him to five different Spanish and Portugeuse clubs over the next seven years, including a successful period with Barcelona (1958-60). In 1960, he moved to Inter, where he developed the style that made him famous. He used a 5-3-2 formation called the verrou (Italian for "door bolt"), which used four fixed defenders, plus a sweeper who patrolled the area between the defenders and the keeper and who was responsible for stopping anyone who made it through the defense. The formation also used the defensive back line to launch rapid counter-attacks. Although the formation did not originate with Herrera, it became popular after the 1964 European Cup Final in which Inter defeated Real Madrid, 3-1. It was widely adopted in Italy and became known as catenaccio. Herrera left Inter in 1968, having won three league titles (1963, 1965, 1966), another European Cup (1965), and two Intercontinental Cups (1964, 1965). He retired in 1981. Labels: Atlético Madrid, F.C. Barcelona, F.C. Internazionale Milano, Helenio Herrera, Real Valldolid, Stade de Français F.C. On 8 November 1926, APOEL FC was founded in Nicosia, Cyprus. The club have since become the most successful club in the country with a record 23 league titles. The club's original name was POEL (ΠΟΕΛ in Greek), which stands for Podosferikos Omilos Ellinon Lefkosias ("Football Club of the Greeks of Nicosia"). In 1928, they added a track and field team and changed their name to APOEL, with the "A" standing for "Athlitikos." In 1934, APOEL hosted a meeting of Cyprus football clubs which resulted in the creation of the Cyprus Football Association. APOEL won their first league title in 1936, then won the next four in a row. To date, they have won at least one title in each decade, their most recent one--the 23rd--coming in 2014. They have also won a record 20 Cypriot Cups. APOEL have enjoyed some success in Europe, playing over 100 matches in UEFA competitions, including the UEFA Champions League, the UEFA Cup, and the UEFA Cup-Winners' Cup. In 1986, they were drawn to face Beşiktaş in the European Cup, but the Cypriot government barred them from playing against the Turks for political reasons. As a result, UEFA disqualfied APOEL from participating in any UEFA competition for two years (but later reduced the ban to one year). Labels: APOEL FC, Beşiktaş J.K.
On 7 November 2008, top-ranked Wake Forest University beat the University of Virginia 2-0 before a crowd of 3,968 at Virginia's Klockner Stadium. The win secured the Demon Deacons' first undefeated regular season in program history. The star of the match was Deacon midfielder Sam Cronin (pictured), whose 6th minute cross was headed in by forward Cody Arnoux to give Wake Forest an early 1-0 lead. Cronin doubled the lead in the 16th minute when he collected a loose ball and fired off an 18-yard strike into the back of the net. 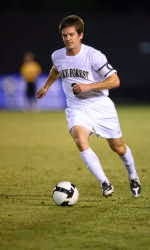 Cronin graduated from Wake Forest in 2009 and currently plays for Toronto FC. Coincidentally, Wake's win came 139 years to the day after the first intercollegiate football game played in the US. In that match, played on 7 November 1869 using rules drafted by the London Football Association, Rutgers University defeated Princeton University, 6-4. Because the London Rules at the time allowed players to use their hands to bat or hold the ball, that match is also generally considered to be the first-ever "American football" game. 6 November 1986 - They Call Him "Sir"